Making these BBQ Beef Empanadas from scratch is quite simple—which is a good thing because your family will likely ask you to make them again. Mix flour and baking powder in medium bowl. Cut in shortening with pastry blender or 2 knives until mixture resembles coarse crumbs. Gradually add 1/4 cup water, stirring until mixture forms ball. Knead dough on lightly floured surface 5 min. or until smooth and elastic. 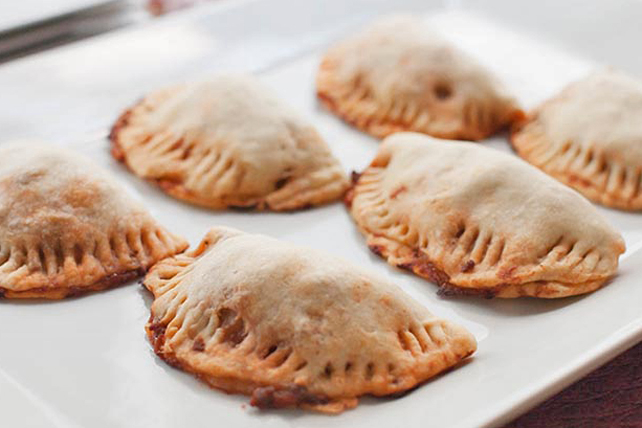 Wrap tightly in plastic wrap; refrigerate while preparing empanada filling. Brown meat with onions in nonstick skillet; drain. Add ketchup, barbecue sauce and mustard; cook and stir 2 min. Cool completely. Heat oven to 375ºF. Divide dough into 6 pieces. Roll out each piece on lightly floured surface to 7-inch round; place on parchment-covered baking sheet. Stir cheese into meat mixture; spoon about 1/3 cup onto half of each dough round. Beat egg and remaining water; brush onto edges of dough rounds. Fold in half to enclose filling. Press tops lightly to remove excess air; seal edges with fork. Brush tops with remaining egg. Serve with simple sides, such as steamed vegetables and a tossed green salad, to round out the meal. Empanadas can be assembled ahead of time. Refrigerate up to 24 hours. When ready to serve, bake on prepared baking sheet as directed.